RE: JSK, as per my promise I would like you to add my testimonial to your website. 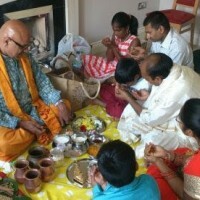 Thank you ever such a lot to perform a Vaastu Havan and a Satyanarayana Kath at my new home in Bracknell Heath. I have witnessed many of the Hindu Rituals with my friends and relatives since I was a young child. My family and friends really talk a lot about you and discuss the rituals you performed on the day with through explanations of Vedas and the Puranas the difference between divine and mortal earth the ethos. You were simply great. You captivated us with your humour as well the explanations of contemporary sciences in relations to Shree Sanatan Dharma which was so great would like to invite you again. I am sorry you were fined as we are on a new estate I have emailed to the council and spoke to them we will be fine as regards to the fine. We enjoyed seeing you again on Holi at your Shree Shakti Mandir had a great darshan and thank you for your blessings while playing Holi with us. Highly recommend for Hindu Wedding. 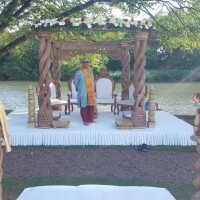 Dipak bhai was our priest for our Hindu wedding in July 2018. I came across Dipak bhai using Google search engine and called the number on his website. I was quick to choose Dipak bhai as my Maraj as he came across friendly, passionate and very knowledgeable. He was always easy to reach by phone, emails and WhatsApp messages. 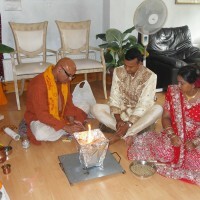 Dipak bhai performed a small Hindu ceremony at my house in London and at our wedding in Iver; for me it was very important that my Maraj spoke English as my husband is not Hindu and I wanted his friends and family to understand the ceremony. The ceremonies were traditional and well explained on the day. Dipak bhai is very helpful in catering to our requirements and timings of the day. He helped us build a schedule for the main day so that proceedings could run as smoothly as possible. Dipak bhai is very likeable and delivered exceptionally on the day and this was greatly noticed by all our guests who continue to tell us how much they enjoyed the ceremony because of Dipak bhai's fun and warm nature. 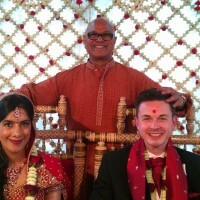 My husband and I were very happy with Dipak bhai and would recommend him to our friends and family for their religious ceremonies as he brought to our traditional Indian wedding, joy, humour, warmth and blessedness. I hope you remember me from mine and Joseph's (not Simon!!) 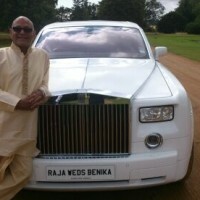 wedding last July at Syon Park. We absolutely loved your ceremony as did all of our family and friends. You were the true rock and roll of the wedding - witty, entertaining and insightful. 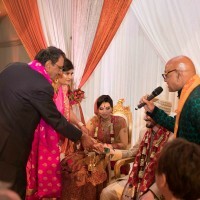 We found that you performed our wedding ceremony perfectly, capturing the essence of the true elements of a Hindu ceremony whilst catering to both Indian and British cultures. Above all, whilst maintaining the decorum of a traditional Hindu Punjabi wedding, you still entertained us all - everyone was engaged. We can't thank you enough for making our day special and for making us smile the whole way through. Thank you pandit ji. Sheena and Joseph wedding Syonpark. Thank you for your insight into planing of my daughter's wedding, I'm really happy to have met you , I appreciate your time and effort through out from the time we called you first , I was impressed by your arrogance , and here we are now, all over , I got your email and the photographs from you of our wedding wow . 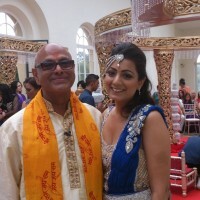 Thank you so much , please do not put any photos of our wedding on your website, thank you for everything you done for us want to come for a Darshan soon at your Mandir. 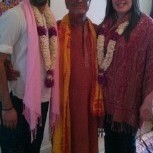 Message : Dipak Pandit ji did house warming ceremony for us at our flat in Chertsey in dec 2011. We found pandit ji's details by searching for hindu priest on internet. That was the first time we performed Havan and we felt so blessed after completing the ritual. 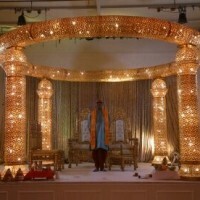 Pandit jis attention to detail, doing every ritual as it should is marvellous. English translation of mantras is the highlight, which made it so easy for us to understand the reason for each ritual, some how when blessing us he said next I will be comming to bless your house . We visited to Shakti Mandir to get blessings from pandit ji when we bought new car. 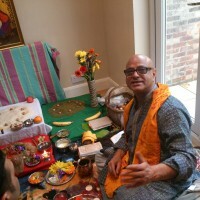 And now we bought a house in Ashford August 2014 its Dipak Pandit ji who did hosuewarming for us i.e Ganapati Puja followed by Havan. Also did puja for our Kuldevta and our ancestors it made us so contended after the process to be able to worship them & get blessings. We see the same dedication,enthusiasm and sense of humour in pandit ji which we witnessed three years ago. 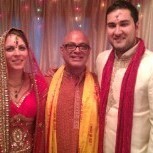 Our family n friends who attended the Puja were all praising Pandit ji for the wonderful ceremony. This time Panditji said I will come to bless your palace next ,we said we only want your blessings we felt the precesnce of Gods and Goddess each time , that in it self is a real blessings. 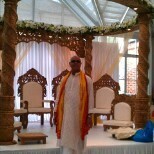 Thankyou very much Pandit ji for your blessings & coming all the way to Surrey. Thank you so much for your help and performing the wedding of our Son Devkumar to Elisa , both were so happy as you kept our guest laughing through out the ceremony , my word you are in wrong trade you should try comedy , but nevertheless you know the priesthood throughly that what I personally liked, as I told you my father was Hindu Priest, thoroughness of the ceremony with mantras wow thank you hope to meet you again soon. A quick mail to tell you was really very good in performing my wedding , pre wedding and post wedding , thank you very much for your promptness and your help I'm sending you the photos of the wedding please do put them on your website. So nice of you to conduct my Santak , I met your father when I got married to my first wife he was the priest then , I appriciate all that you done for me personaly l loved your humor nice upgrade ceremony for me. So nice of you to come all the away to Normandy for our wedding ceremony , all our guest said some nice things about you, I just want to say a big thank you. Thank you very much you was so good we gave you the time to get most out of you . which believe my words , 2 hours and every one listen to you wow the way ladies hugged you .. my word you should go in show business. 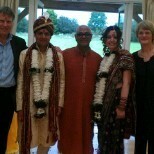 Just wanted to say a big thank you for presiding over our marriage ceremony on the 18th April. 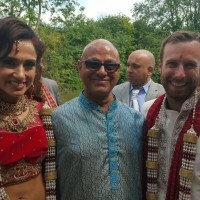 Matthew and I both agreed you did a fantastic job, everyone was speaking very positively about the way you conducted the ceremony, making Matthew feel welcomed and including all the non Indian guests at the wedding. Your humour and delivery made the wedding all the more enjoyable. Spot on thank you very much truely impressed at the way you kept our guest attentive with such an ease , I have witnessed wedding where priest shout and stop the wedding till every one is silent , no one is allowed to breath almost ! my daughter jasminy was so happy you made an mark , we thought it will be impossible almost 800 was the turn out. Thank you very much for being a real help for playing a major part in planning and into an eventual success of our daughter's wedding Vanda to Ravi. 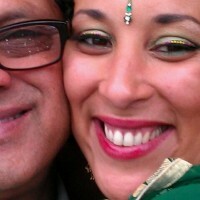 Saran and Monoj Kohl. Best wishes well done. sorry for the late response as we have just about recovered from the wedding and the honeymoon please find the attached photos of the wedding ceremony which was conducted so well , truly amazing the way you explained everything in English, everyone present had a good time especially our English guest . Nisha sends you her regards and apologize for not being nice to you initially, at first she thought it would be an ordinary wedding ceremony but you went beyond her belief, she says you brought a new dimension to the Shree Sanatan Dharma, while entertaining with your spot on sense of humor , from bottom of our hearts thank you very much for being our priest. Our feedback is that everything went very well and you produced many fans during the wedding - even today when we speak to friends, they ask 'where did you find that priest, he was great)! You really did a fantastic job and made everything very easy for us and very enjoyable for the guests. Once again thank you for conducting our second son Matthew's wedding to Deema. A thought provoking ceremony between two religions.